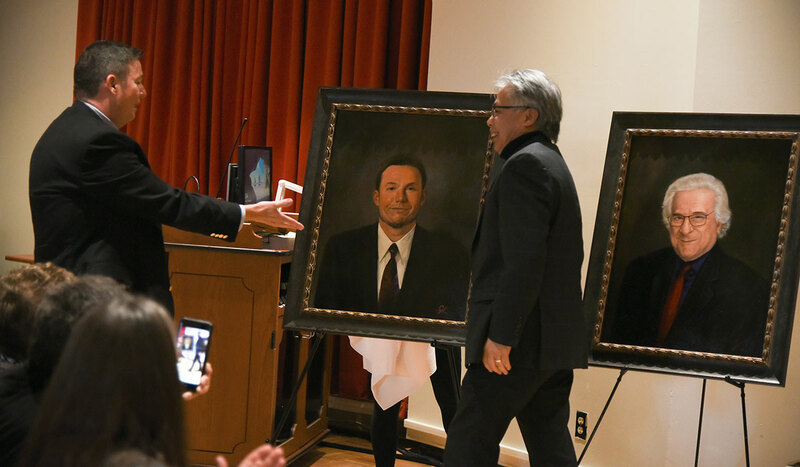 As a graduate student in cello performance at the Benjamin T. Rome School of Music, Jie Li remembers the portraits of the school’s first two music deans — John Paul (1965–1972) and Thomas Mastroianni (1972–1981) — that hung in Ward Hall. 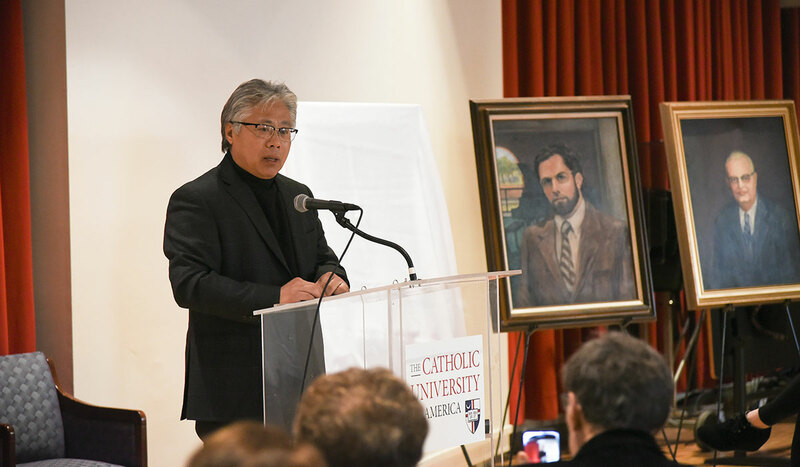 Li says he came to the University from China in the late ’80s “with nothing but my cello and a big heart.” He graduated in 1993 with a doctor of musical arts degree in cello performance. That accomplishment, he says, was in part due to the music faculty who helped him along the way and a small scholarship provided by then-Dean Elaine Walter from a discretionary fund used to help students in need. 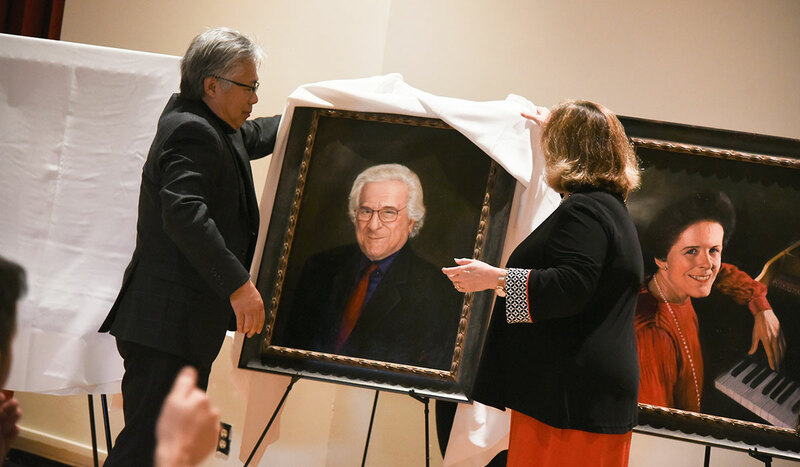 After graduating, he returned to China, where he was appointed cello professor at Shenyang Conservatory of Music and enjoyed a thriving career as a performer, most notably as the principal cellist of the Liaoning Symphony Orchestra. 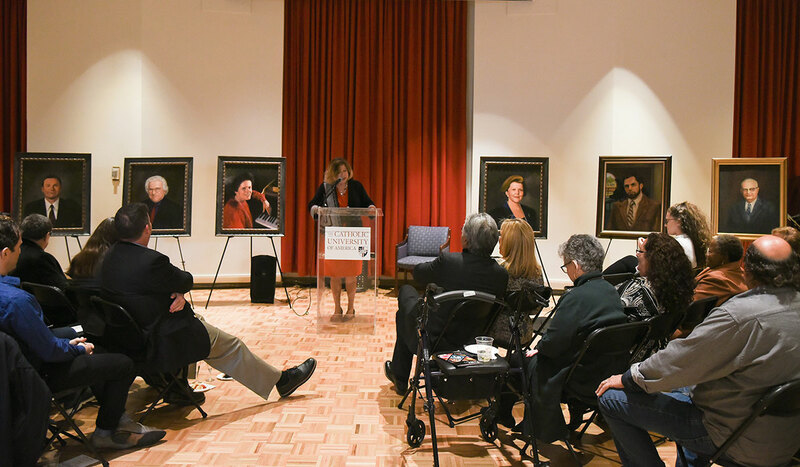 He retired in 2011, and returned to the United States to begin his second career as a portrait artist. 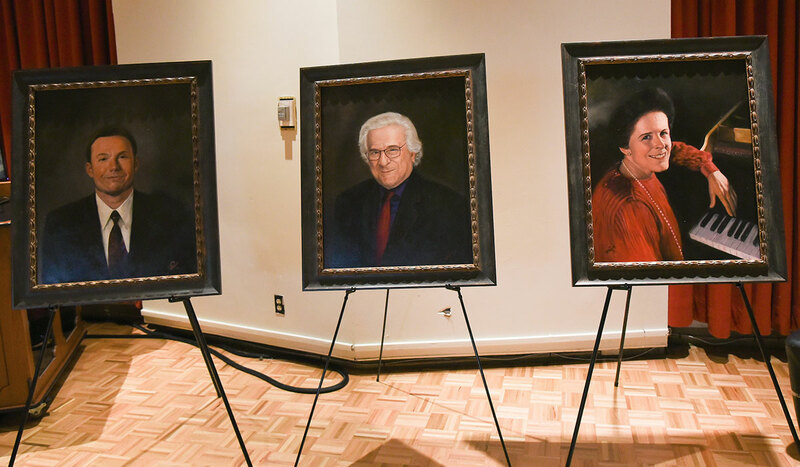 And he never forgot those two portraits of Deans Paul and MastrFoianni. 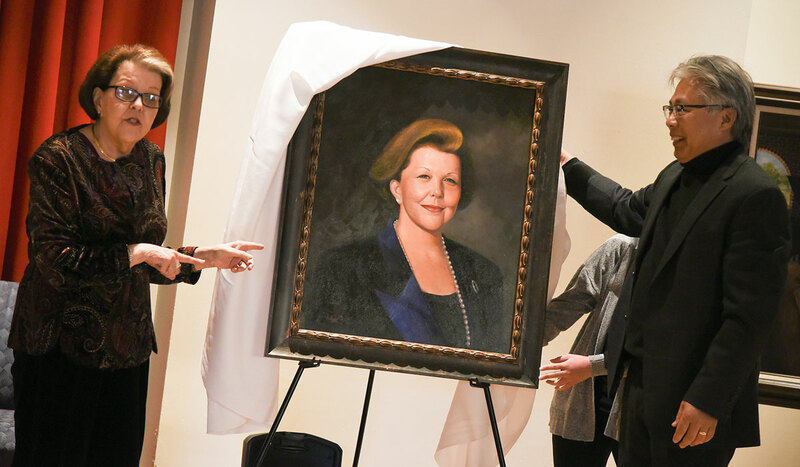 The portraits of four deans — Elaine Walter (1981–2001), Marilyn Neeley (2001–2002), Murry Sidlin (2002–2010), and Grayson Wagstaff (2010–2018) — were unveiled Sunday, Nov. 11, at a ceremony and reception in the John Paul Hall of the Ward Music Building. 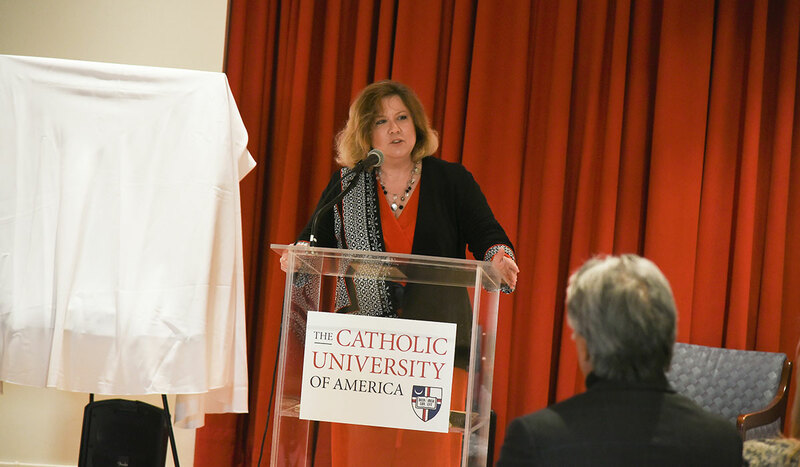 It was attended by students, faculty, and friends of the arts at Catholic University and hosted by Jacqueline Leary-Warsaw, dean of the Benjamin T. Rome School of Music, Drama, and Art. Walter and Wagstaff were present, as were family members of Neeley and Mastroianni. Sidlin was in New York rehearsing for a performance at Carnegie Hall the following day. 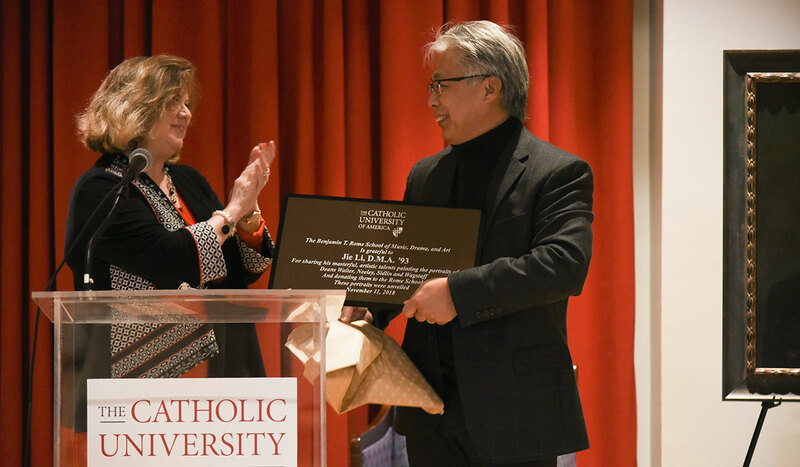 Last June, Catholic University’s Board of Trustees approved the merging of the departments of art and drama with the music school. 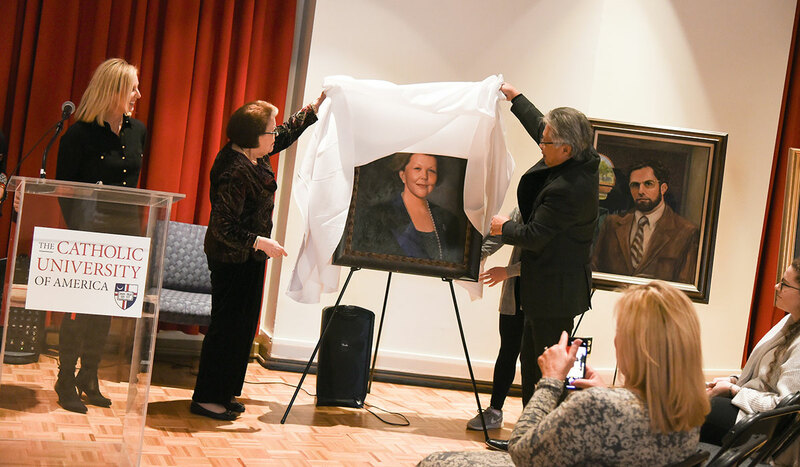 The new Benjamin T. Rome School of Music, Drama, and Art officially opened when the fall 2018 semester began. 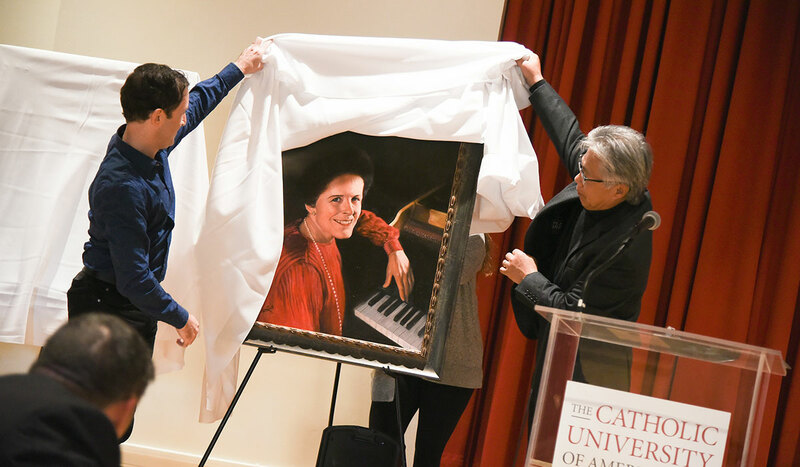 In her remarks, Walter pointed out the serendipitous timing of a musician-portrait artist returning to the University at a time when the new school brings performers and visual artists together, giving new priority and emphasis to the arts at Catholic University.